How do I remove ads on my Invitation or Save the Date? To remove advertisements on your Invitations, Save the Dates, and Digital Cards, you would need to upgrade to a Punchbowl Platinum or Business membership. You can review the membership features and cost here. Once you purchase a Platinum or Business membership, the option to remove ads will immediately be turned ON for all of your invites. You can adjust this setting from the Invitation Options menu under the Member Features tab. If you have not yet sent your invitation, you can access invitation options on the Add Guests page by clicking the Set Options button. 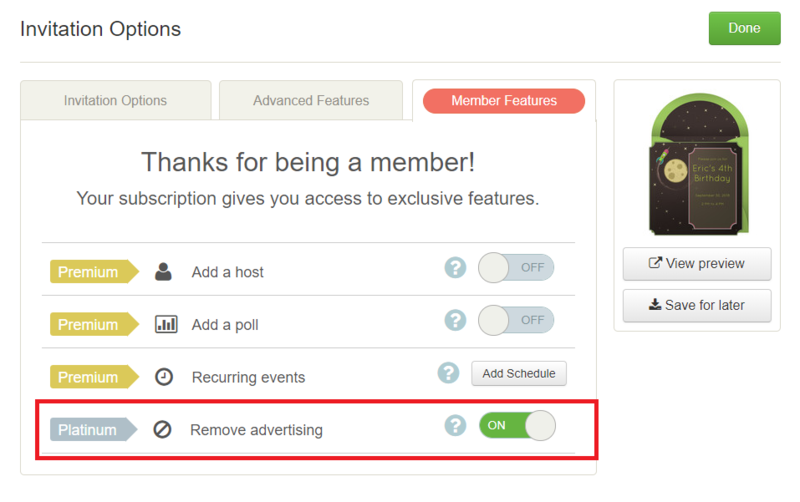 From there, click on the Member Features tab and the Remove Advertising option will be located at the bottom of the list. If you have already sent your invitation, the options can be adjusted from the Manage Invitation page. Once there, click on the Invitation Options button on the right side of the page. From there, click on the Member Features tab and the Remove Advertising option will be located at the bottom of the list. If you are using the mobile app and have not yet sent your invitation, you can access the invitation options on the Review and Send page by tapping on the Invitation Options button at the bottom of the page. Next, scroll down to the bottom of the page and tap on the Show button for the Member Features tab. The Remove Advertising option will be located at the bottom of the list. If you are using the mobile app and have already sent your invitation, the options can be adjusted by tapping on the My Invites tab and selecting your invitation. Once there, you can tap on the Invitation Options button. Next, scroll down to the bottom of the page and tap on the Show button for the Member Features tab. The Remove Advertising option will be located at the bottom of the list. Note: Ads can only be removed from accounts with an active membership. If you were to cancel your Platinum membership, your invitations would no longer be ad-free.